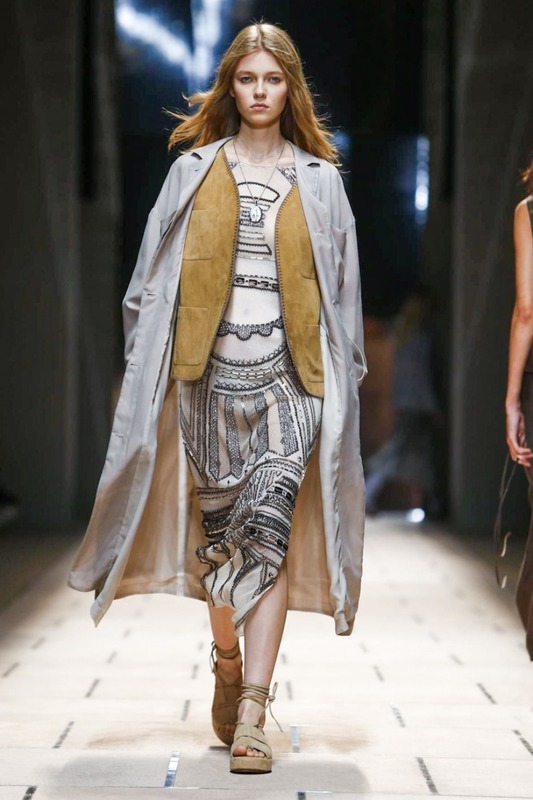 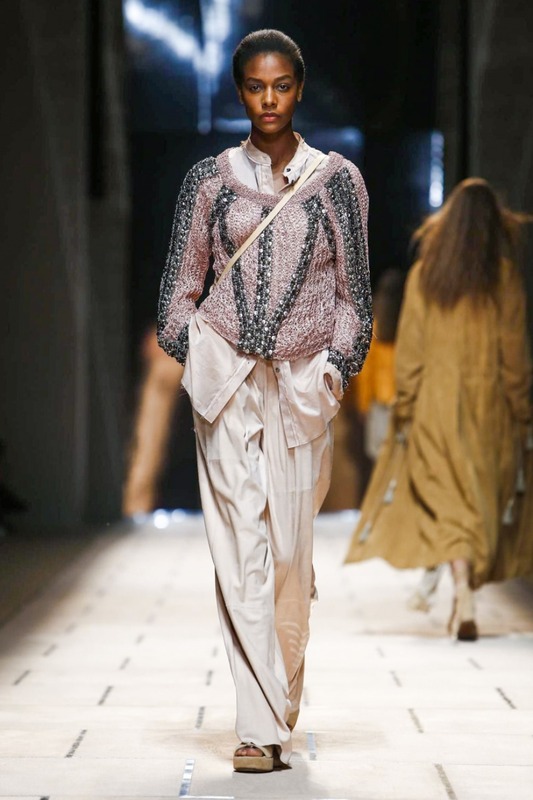 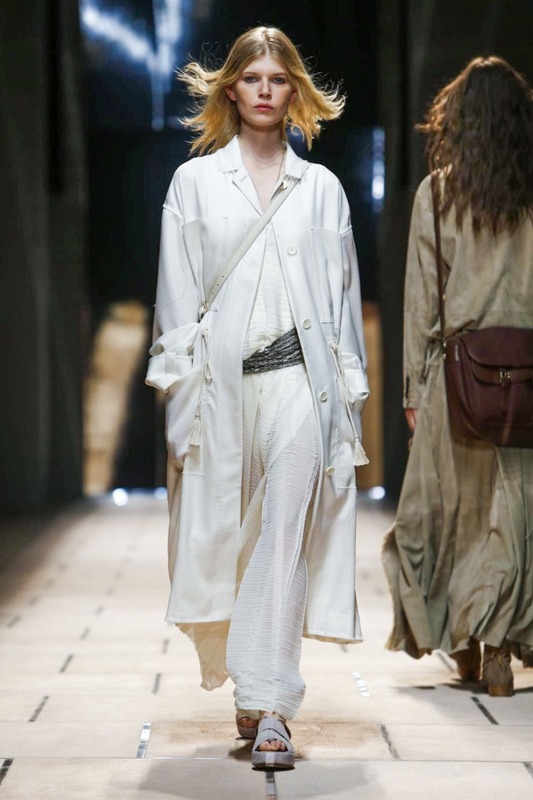 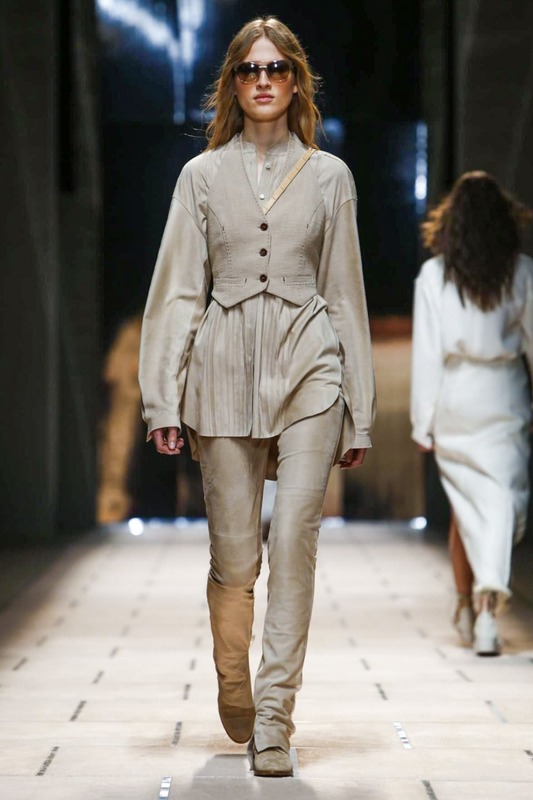 Trussardi 1911 Spring/Summer 2016 ready-to-wear collection -Milan Fashion Week. 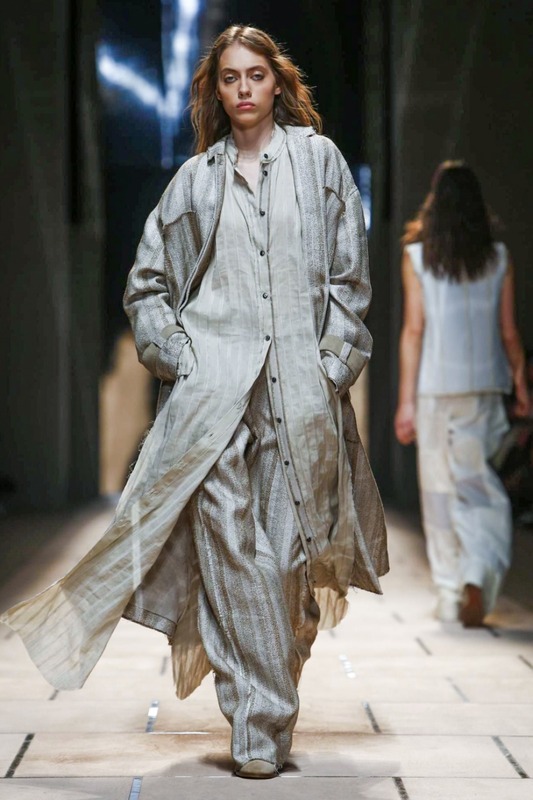 The result was a collection intended to appear sandblasted, wind-whipped, and faded by the sun. 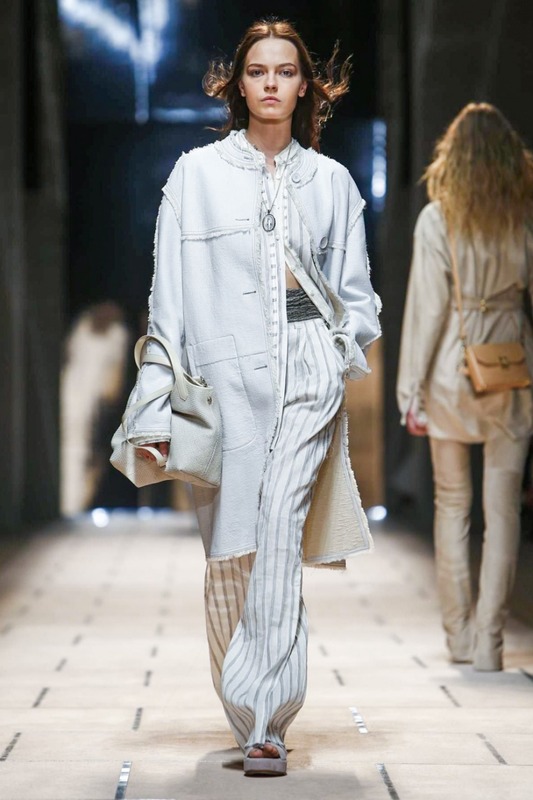 Long-skirted jackets and pleated full pants in neutral striped herringbone linen were left unfinished and tattered at the edges. 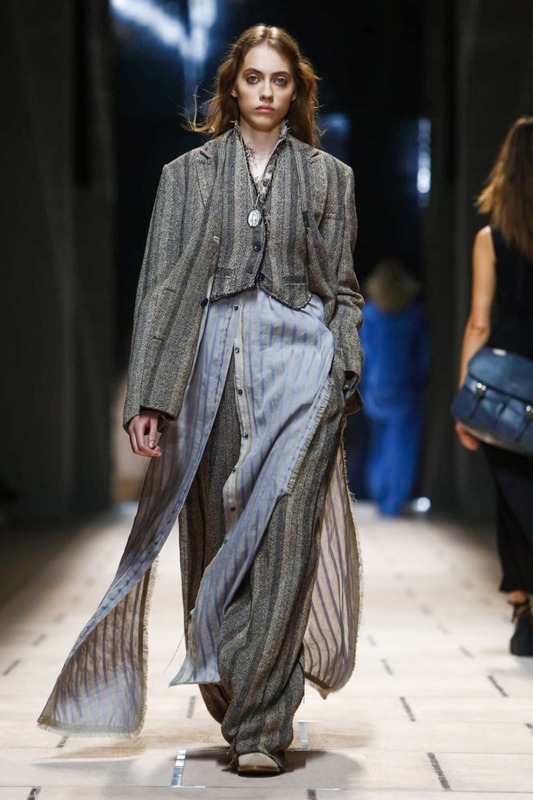 The ribboned bib on a blue shirt was ruffled as if by force. 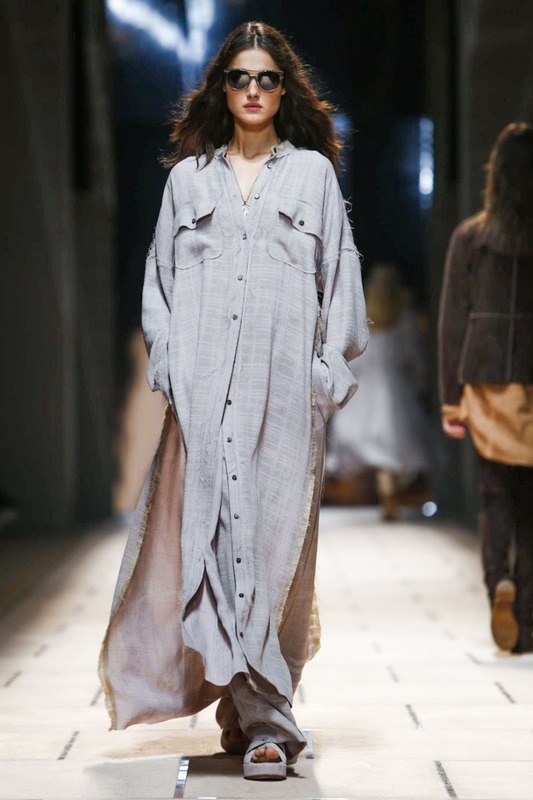 Shirts—more like caftans—were delivered ankle-length, split to the hip, and worn as layers under jackets or as a piece of outerwear. 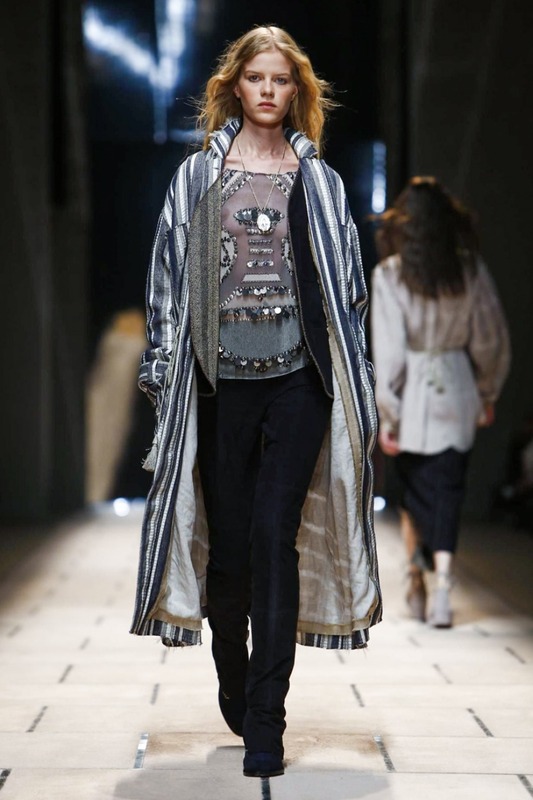 The beaded prints were created from blown-up images of religious tribal masks and the models all wore Virgin Mary necklaces. 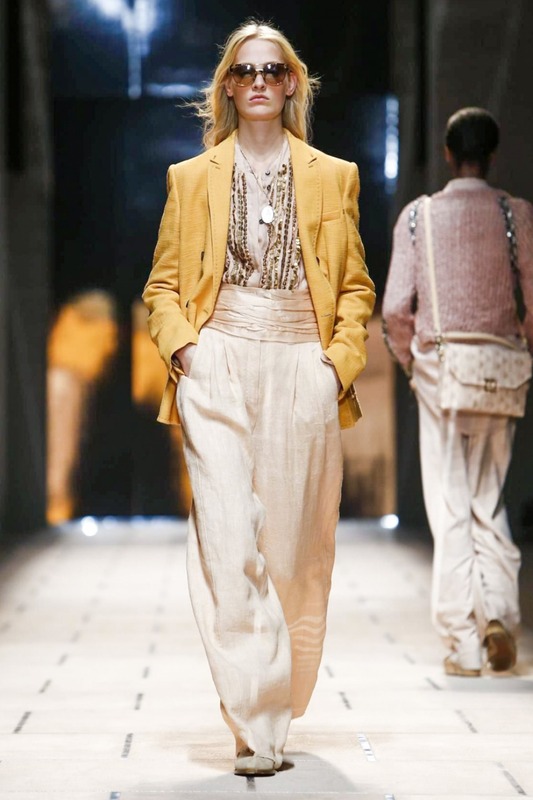 The palette swerved from neutral to pastel with debatable success; these rough-hewn, heavy-textured loose pieces rather disagreed with the prissiness of soft pink and apricot. 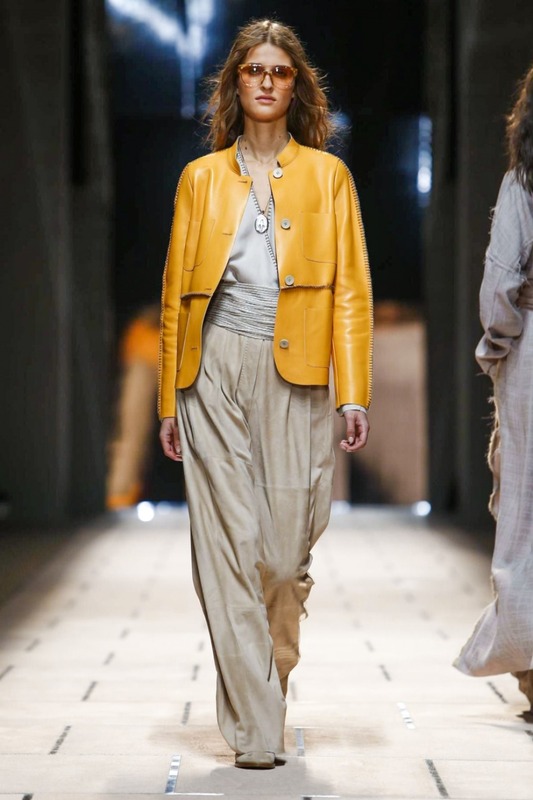 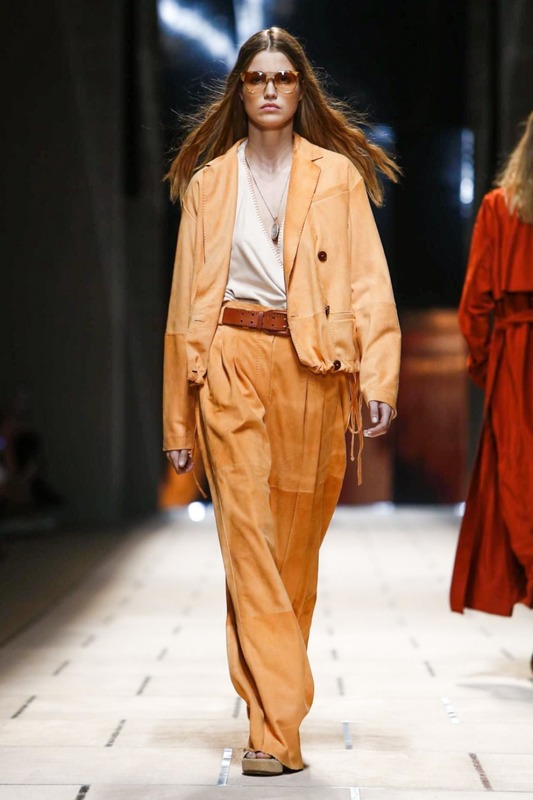 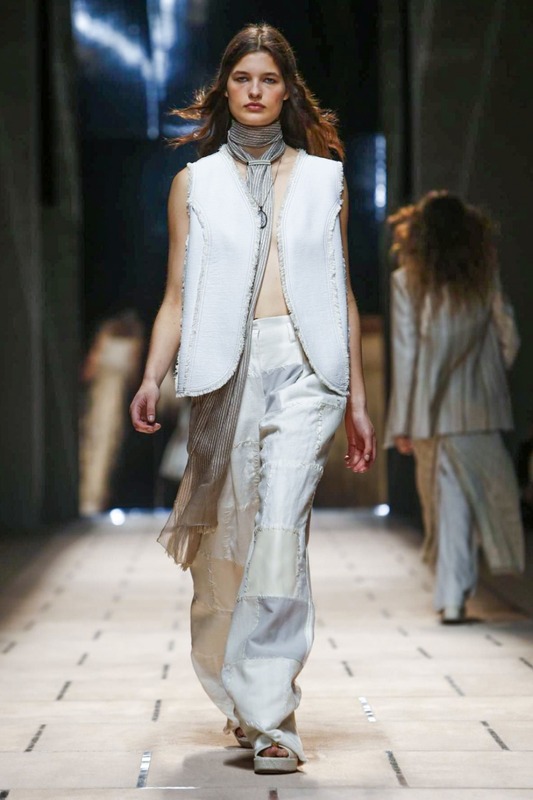 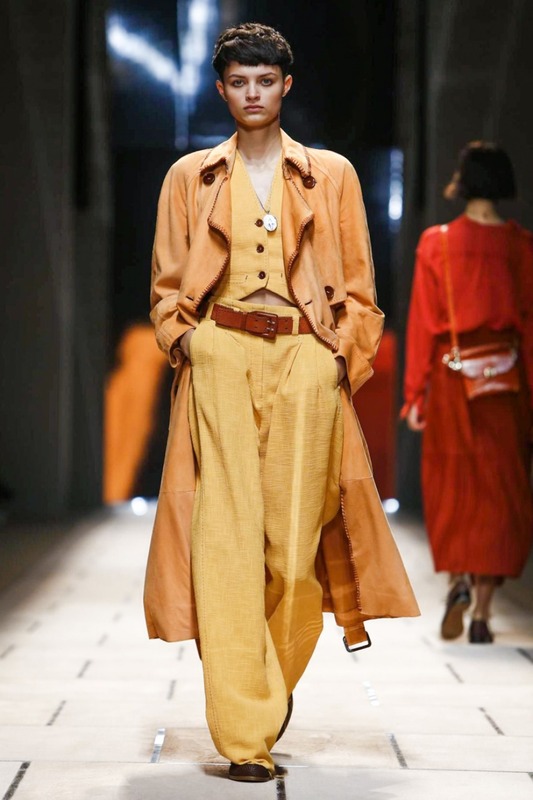 Trussardi has complained that when it comes to using leather in her collections, she is damned if she does and if she doesn’t – than everyone asked -why didn’t she?!. 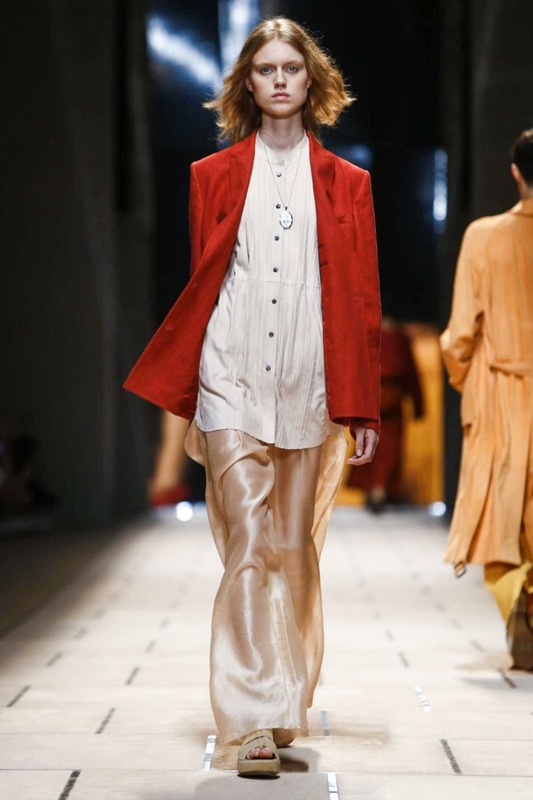 Today she went with wrap split skirts and a fine raspberry duster jacket in double-layered suede and yellow jerkin-like calfskin crop tops, as well as a long gown with a half-moon panel that was cut too narrow to walk easily in. 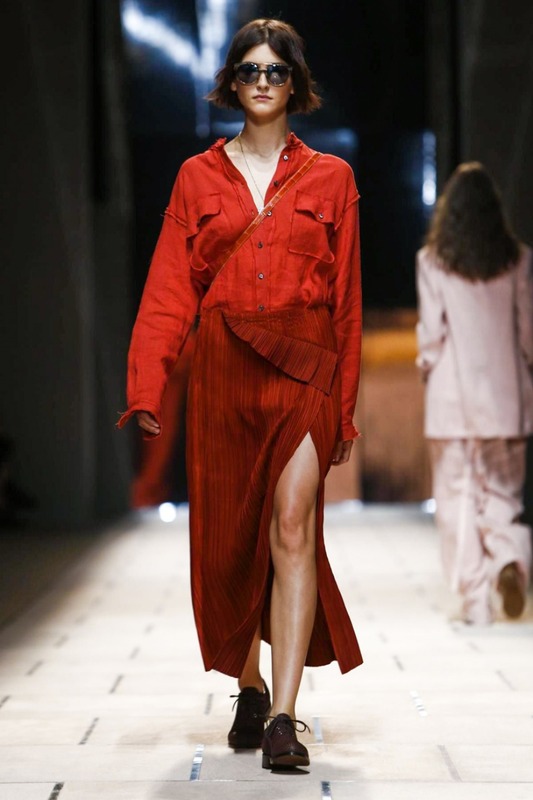 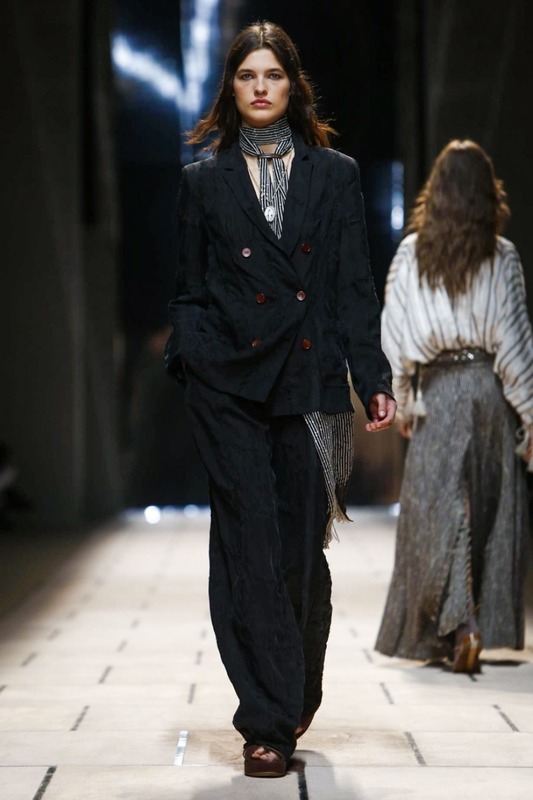 The collection was pretty good, the tailoring fine , and there was plenty to catch the eye of liberal-leaning acai eaters in search of clothes that signal urbane rusticity and luxurious roughness.